There are a lot of different views from people when they hear the word waiter or waitress. For some, being a waiter is a drawback in a career choice, but for seasoned waiters working in big hotels, it’s probably the easiest way to earn money without having to face the challenges of someone working in the office. Waiting on tables may look like an easy job, but there are tasks and responsibilities to be considered. 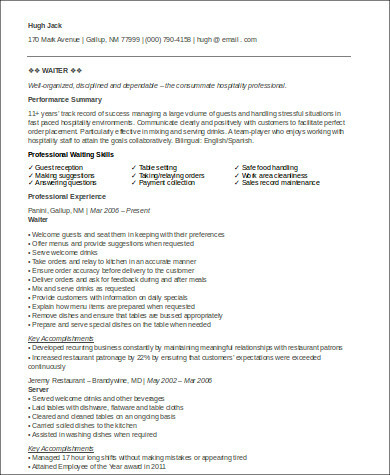 Our Sample Resumes for those applying for a job as a waiter is an excellent reference on how to lay out your resume correctly. 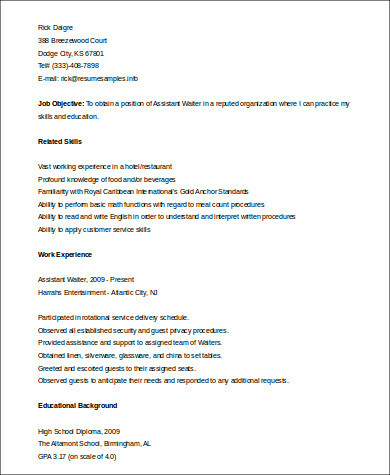 There are a lot of applicants for this kind of job, so it’s important that your resume will need to be outlined perfectly with your experiences being highlighted so it can be seen easily. 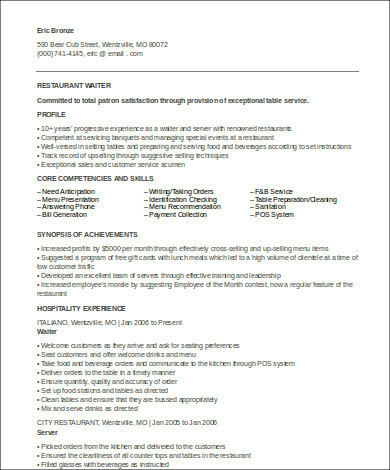 Being a waiter may look like an easy task, but like any other job, there are lots of challenges involved. For one, it can be quite stressful if you happen to be working on a very busy restaurant with lots of customers asking for their orders at the same time. 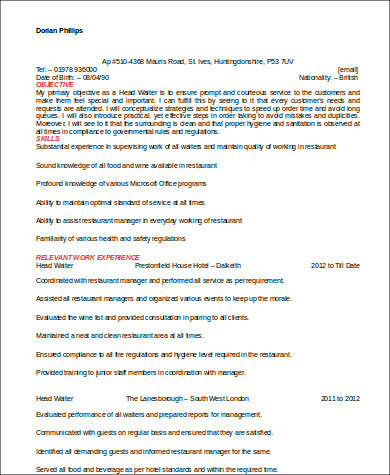 There are a couple of pros and cons to the job, but if you’re lucky, you could be promoted to headwaiter when your performance is rated to be excellent by your employers. You don’t need to wait every time for payday to be able to have some cash. Every time you finish your shift, you’re bound to leave with money in your pocket. Of course, the amount you’ll get will depend on the tips you make. Unlike other kinds of work, you have no work to bring home with you. There are no deadlines to be met and there are no stressful worrying to be done of having unfinished tasks that you’d need to work on the next day. Holidays and special days like Christmas and Valentines will bring in lots of people you normally won’t see on ordinary days or even on weekends. Depending on how well you take care of the customers on the table assigned to you, you could bring home generous amounts of extra tips on these special occasions. Your rest day is not defined and it may move a couple of times, and of course there are times like on special occasions and holidays like Christmas that you won’t have any rest days at all. The stress of having to be constantly on your feet most of the time and carrying heavy trays will have you developing back and knee problems in due time. There are no sick leave and and medical benefits, and you surely won’t get paid when you’re absent from work. 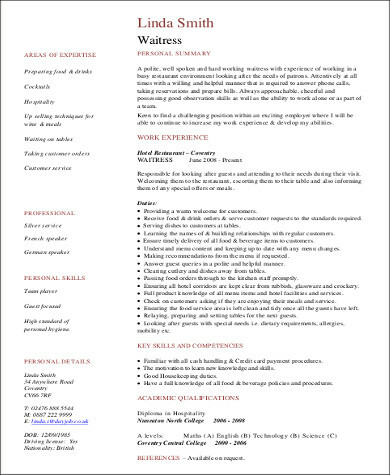 The pros and cons mentioned above are just some of the things to consider when applying for the job. Ultimately and at some point, when you’ve gained enough experience and you get promoted, the good things about the job will outweigh the bad. 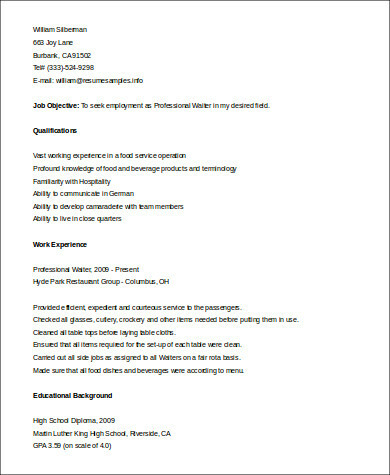 Our excellent Waiter Job Description Samples and Sample Waitress Resumes will help you outline your application outline properly. People love to eat, and that fact alone will ensure waiters will never run out of jobs in a market where jobs are scarce. Once you get hired and if the pay (and tips) are good, you may want to stay before ultimately deciding to move on to better careers. 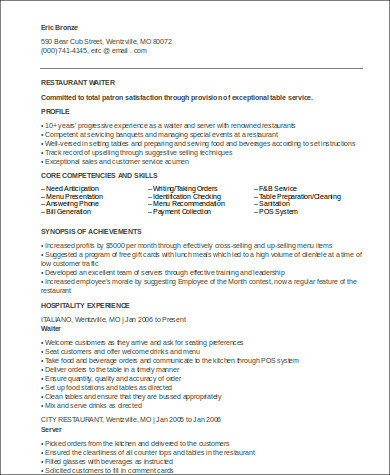 We are also offering free downloadable Server Resume Samples for food servers in cafes and restaurants. These are all available free for downloading and printing.